I love watching the birds that visit us as they eat, flutter, hop, and interact. Abiding by a policy of cautious tolerance, they mostly ignore each other: at the feeder that hangs at the edge of the porch, while dipping into the surface of our largest pond or making a crazy spray of water by beating their wings in the little waterfall, and as they stroll across the lawn in search of favorite snacks. Occasionally a big scrub jay or Steller’s jay will bully the little birds away from the feeder, and once a kingfisher swooped across the porch and scared everyone away. But usually the view from our kitchen window is peaceful. Over the last month or so, we’ve had some new birds at our feeder and splashing in the pond. I was excited to see my old friend, the black-capped chickadee, whom I knew from living in more northerly places. I had thought that the presence of the chestnut-backed chickadee meant we were out of the black-capped chickadee’s range, but a month ago I glanced out my window, and there he was! 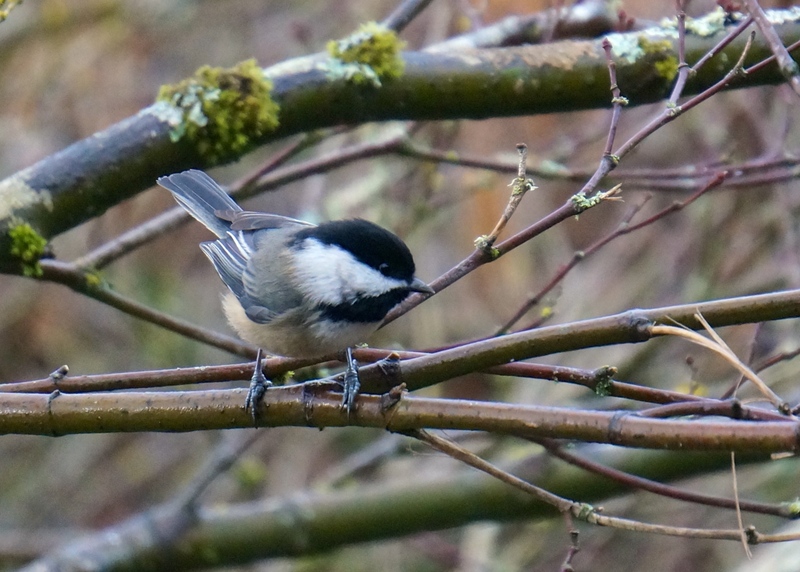 I love this cheerful little black-capped chickadee. We also have a pair of varied thrushes. I thought at first they were two different types of birds, but ten minutes or so searching the Cornell Lab of Ornithology’s “All About Birds” site revealed that the bright orange male and the soft peach female are the same species. There’s also a robin in the (embarrassingly pixellated) picture with the female — they stayed all winter, but their numbers seem to be increasing over the last month, at least to my inexperienced and unscientific eye. Female varied thrush taking a bath, with a robin perched in the background. A more showy male varied thrush. 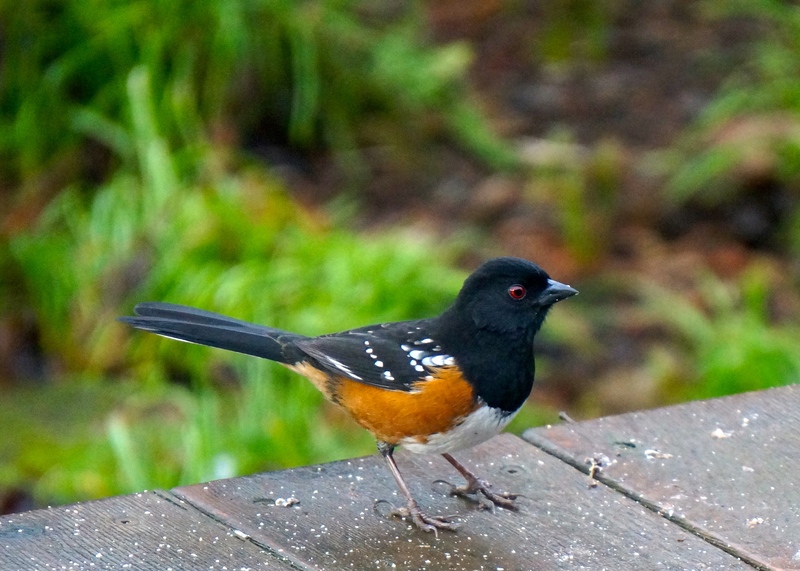 Another new feathered visitor, first seen about two months ago, is the spotted towhee. It’s an attractive bird with a bright orange-red breast and glossy black head and neck. This little guy might not look exciting, but I was happy to see a familiar bird — a common sparrow. I’ve seen lots of golden-crowned sparrows at the feeder through the fall and winter, but this was my first time seeing this modest little bird. 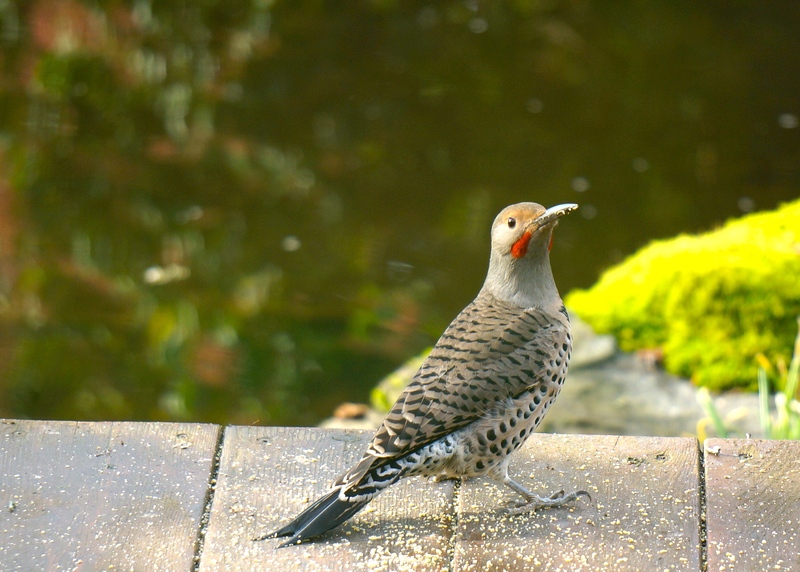 And I’ve been seeing this Northern Flicker for some time now, but for some reason his bright red teardrop cheek markings are unusually vivid right now — or maybe I just haven’t been too observant lately. My most exciting photo triumph isn’t from a new bird, though, but from birds I’ve consistently failed to get a photo of for nearly a year now. We have a family of California quail that roam our property and the adjacent fields. They’re really shy, and though they’ve visited our porch to get dropped seeds, I’ve never managed to get a picture. Until this moment a week ago, when the whole family came strolling up the lawn to idle around the pond and snack on the seeds fallen from the hanging feeder, as if they were visiting a favorite cafe. Finally, finally, finally, I captured them! Aren’t they beautiful?